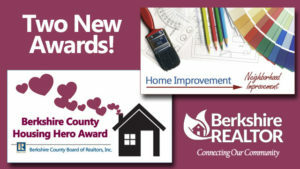 Berkshire Housing Hero: The Berkshire County Board of REALTORS is seeking nominations for our new Housing Hero award. This award is for any individual, community leader, legislator and/or organization helping to make Berkshire’s housing diverse, affordable, available, sustainable, safe, and/or healthy. The future of our community depends on filling this critical need. Please review the criteria and complete the simple Housing Hero PDF application, and email to Sandy@BerkshireRealtors.org today! Berkshire Beautification! Sometimes a little bit of change and can make a huge difference!! Do you know of a property that was recently renovated or significantly cleaned up that improved whole the neighborhood? We want to hear about it! You are invited to submit a nomination for the Berkshire Beautification Award to recognize any Berkshire property owner (Commercial or Residential) who had worked hard on their property to the betterment of the whole neighborhood. We want to recognize and congratulate property owner’s hard work – small scale improvements can have big benefits! Complete the simple Beautification application, and email to Sandy@BerkshireRealtors.org today!. Photos extra helpful! The awards committee of the Berkshire County Board of REALTORS, 99 West Street, Suite 200, Pittsfield MA 01201 (414) 442-8049 will review all submissions and notify the winners at the end of May and September of each year. Thank you!